asiaSpa India is Indias only wellness & lifestyle magazines that caters to the urban professional prolific spender who is a global traveler and likes to be updated on latest luxury and wellness lifestyle trends. Wellness today is the fastest growing industry segment and asiaSpa India has found a very high level of acceptability with the affluent Indian. With a truly international look & style, asiaSpa India is a treasure trove of information on Spa's , health, wellness, travel, beauty and luxury lifestyle. Targeted at the up market professional aged 25+ asiaSpa India explores the world of luxury wellness lifestyle. Published on a bi-monthly basis with a print run of 50,000 copies, asiaSpa India reaches people who have already adopted wellness as a lifestyle or are aspiring to do so. Look beautiful, Feel healthy... asiaSpa India invites its readers to step outside their everyday urban environment and escape to a tranquil world where mind, body and soul are refreshed. asiaSpa India is Indias only wellness & lifestyle magazines that caters to the urban professional prolific spender who is a global traveler and likes to be updated on latest luxury and wellness lifestyle trends. Wellness today is the fastest growing industry segment and asiaSpa India has found a very high level of acceptability with the affluent Indian. With a truly international look & style, asiaSpa India is a treasure trove of information on Spa's , health, wellness, travel, beauty and luxury lifestyle. Targeted at the up market professional aged 25+ asiaSpa India explores the world of luxury wellness lifestyle. 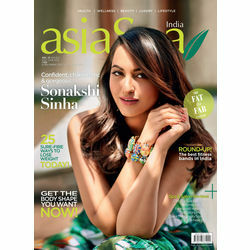 Published on a bi-monthly basis with a print run of 50,000 copies, asiaSpa India reaches people who have already adopted wellness as a lifestyle or are aspiring to do so.